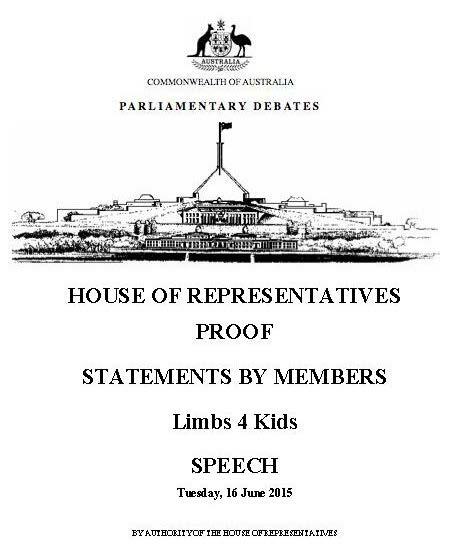 After the launch of our new Limbs 4 Kids program, Limbs 4 Life received numerous congratulations and recognitions from Ministers and Members of Parliaments across Australia. The Hon. 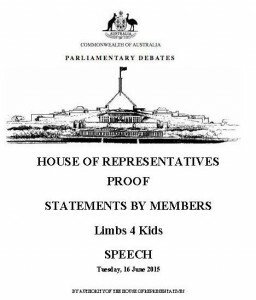 Warren Entsch MP (Federal Member for Leichhardt), who has personal experience of limb difference, kindly made a speech about Limbs 4 Life and the Limbs 4 Kids program in the Australian Parliament on the 16th of June 2015. We thank Mr Entsch for bringing attention to the needs and resilience of children with limb difference to the Australian Parliament and public. “Limbs 4 Life is Australia’s peak organisation for amputees and persons with limb difference. This month, they launched a new program – Limbs 4 Kids. For the first time, all Australian children and young people with limb differences and those who care for them have a program and a website to call their own – www.limbs4kids.org.au. It is a source of great information, contacts and resources for parents and healthcare workers who care for children and young people who are born with a limb difference or who have had a limb amputated during their childhood. The website features a learning centre, online forum, stories, videos, and Thrive magazine, together with networking and training opportunities. Australia is estimated to have over 2,500 children and young people with a limb difference. My beautiful granddaughter Sarah Victoria is one of them. Sarah was born with a missing forearm as a result of the umbilical cord cutting off the circulation in-vitro. Sarah has not let this stop her in life. She is as active as any other child and enjoys riding horses and quad bikes. She is now 10 years old and wants to be able to ride a dirt bike like her father. She recently tried on her first prosthetic arm, which was very exciting and very successful. She got up for the first time recently with this new arm to ride a bicycle and now she is very confident to getting on these quad bikes. Read the Hon. Warren Entsch’s speech here. Australia’s first program for children living with limb loss launched Win a copy of the ‘Little Miss Jessica Goes to School’ book!